I haven't been posting much lately, but I've been doing a lot! Not 'doing' in the sense that I've got a lot to show for it, but more out-and-about kind of doing. Mother's day brought a trip to visit Chad's family up in the Twin Cities. His family is always more than inviting and fun to hang out with so I look forward to these mini-trips. I also have a great infatuation with Minneapolis and St. Paul. They are a great graphic design mecca/hub of the midwest, and house so many cool local coffee shops and cute stores around every corner - I always find something new to see whenever I visit. This trip Chad had the great idea to try the Jucy Lucy from Matt's Bar. I've already been to the other famous home of the other Juicy Lucy, the 5-8 Club. Can't say I have a favorite, but Matt's will always have a special memory as the place where Chad took one first bite of his burger and exploded the 'Jucy' out the other side all over his right arm and sleeve. I, the horrible girlfriend, died laughing but managed to pull it together enough to ask, "are you ok? are you ok?" Luckily he wasn't burned and later manged to get the cheese and grease out of his shirt. Imagine if someone was sitting next to him -they would have had a Jucy Shower! 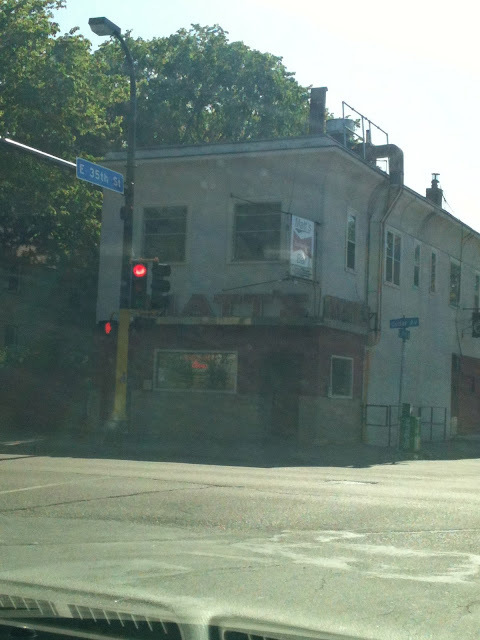 Matt's Bar, one of the 2 known places in Minnesota to try a Jucy Lucy. We then headed to the Twin's game at Target Field - our first time visiting and a gift from me for Chad's birthday. What a great stadium! I really enjoyed checking the view from every angle - I think we walked around it 3 times while fining our seat, visiting with some friends, gathering our selected food and beer of choice, and also picking out a Twins hat souvenir for Chad. He's a big Twin's fan, so I think it was quite a thrill for him to see them play in something other than the Metrodome. We had pretty great seats and the night turned out to be perfect - other than the Twins loss. I definitely live my life with a work hard, play hard mentality. After a long week at work, nothing is better than avoiding all technology possible (other than my kindle), and just taking in the surroundings. I returned home from up north to the most amazing and intoxicating smell of the lilac bushes that are right outside my window. After work, I just love coming home to that smell that constantly drifts through my small apartment and envelopes the whole place. I can't help but stop and take it all in and take a load off! This row of Lilacs was a nice surprise to come home to. One of my favorite smells from spring! One think I DID manage to do was a bit more planting. Granted, it was Monday night, after work, so by the time I went around to the stores and got everything I needed, I was planting in the dark. Chad's mom totally motivated me to create a few boxes full of lettuce. She had a few that looked so lush and full, and she was able to have all this great lettuce for eating for the week. How cool is that to hot have to purchase it from the store? I filled two boxes, one completely of romaine and the other of two leafier types of lettuce. I made the mistake of not watering them right away, since I was pretty wiped out at that time of night after getting them all planted, so they look a bit worse-for-wear! Hopefully they will take to their new home and I'll soon be having amazing salads for dinner every night! Leaf Lettuce - I'll have to keep you posted on the actual type that this is; there are one version on each half. Remember! Spring is only memorable if you actually take the time to stop from your normal hustle-and-bustle and take it all in. Here's one of my favorite quotes, taken from Ferris Bueller's Day Off, "Life moves pretty fast. If you don't stop and look around once in a while, you could miss it." Watch for more photos of how the patio is actually taking shape!